Item is fully tested and all functions 100% working. 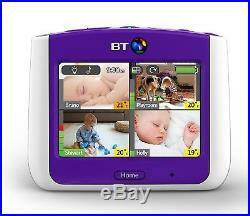 BT 7500 Lightshow Digital VIDEO / SOUND Baby Monitor 3.5 Inch COLOUR Touchscreen - SUPERB With Li-Ion Rechargeable Battery Pack, Night Vision and Zoom/Pan/Tilt Camera Function. 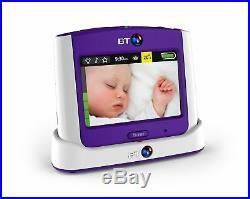 The BT Video Baby Monitor 7500 Lightshow gives you peace of mind when your baby is resting or sleeping peacefully. There are a host of features to help your baby drift off to sleep and let you get on with things. It's twinkly projected Lightshow featuring stars and moons helps your little one drift off to sleep along with a choice of 19 calming Lullabies. 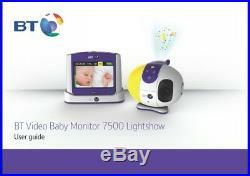 It also has a gentle soothing night-light so you can check on your baby when in the nursery. 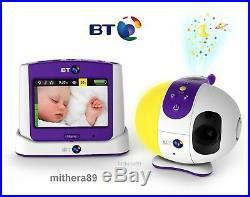 Unlike some video monitors, the night vision lights on the baby unit of the BT 7500 Lightshow are completely invisible when it is dark. This means its sure not to disturb your child. It has a huge range of up to 50m indoors and 300m outdoors, so you can be sure to always be in contact as you move around your home. There is a dock included for easy charging. 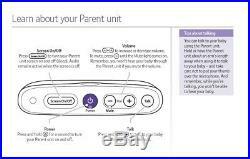 The parent unit uses Micro USB for its power cable. This is handy as it means you can also charge it with most other Micro USB chargers. Other features include a mute function, crying alert, low battery alert and out of range alert. The baby unit has a tripod thread and is wall mountable (screws included). The BT Video 7500 Lightshow supports up to 4 cameras at once. You can watch all 4 on split screen and then easily see one full screen if you hear a noise. The sound feed cycles between each camera or you can choose to switch sound manually between cameras. 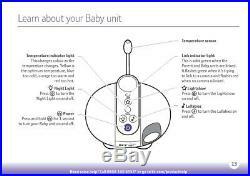 So when you want to watch TV or make the dinner in the other room, but want total reassurance that your baby is safe and sound in the cot, the new BT Video Baby Monitor 7500 Lightshow is the Baby Monitor for you. 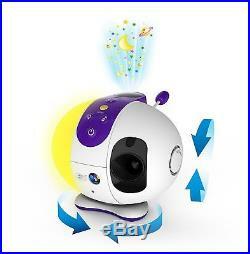 Twinkly projected Lightshow featuring stars and moons to help your little one drift off to sleep. Large 3.5 inch Colour Touchscreen LCD display with Full Screen or Split Screen Images. HD sound for crystal clear audio so sensitive you can hear your little one breathing. 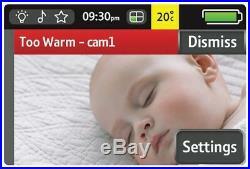 Temperature display lets you know how hot or cold it is in the nursery. 19 Lullabies including classical, nursery rhymes, white noise, nature and womb sounds. Remotely Pan, Tilt and Zoom the camera all from your parent monitor. 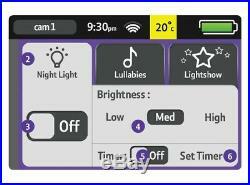 Night Vision Camera automatically switches on + gentle Night-Light for when you are in the nursery. Huge 50m indoor range and 300m outddors. Easy charging dock for your convenience. Low Battery Alert and Out of Range Alert. Camera can be tripod mounted or wall mounted. Multi-Camera operation - supports up to 4 cameras at once. Two-Way Talkback so you can soothe your baby. Secure and Interference-Free Digital Signal. Parent Unit - High Quality 3.5 Digital Colour LCD Touch-Screen Display. High-Capacity Rechargeable Li-Ion Battery Pack within Parent Unit. Nursery Unit Camera - With Lightshow, Infrared Night Vision and Tripod / Wall Bracket Mount. 2 x Mains Power Plugs. 2 x USB to Micro USB connectors. Docking Station for Parent Unit. All items will be very well packaged to ensure safe arrival. Item will be very carefully packed to ensure safe arrival. Please contact me if you have any questions and thank you for looking. 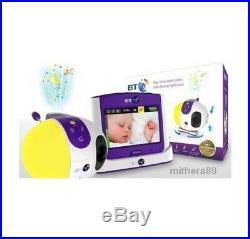 The item "BT 7500 Lightshow Digital VIDEO SOUND Baby Monitor 3.5 Inch COLOUR Touch-Screen" is in sale since Saturday, January 19, 2019. 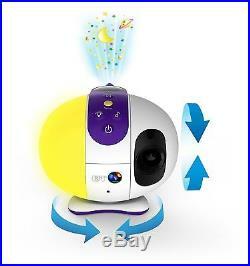 This item is in the category "Baby\Safety\Baby Monitors". The seller is "mithera89" and is located in Bradford. This item can be shipped to United Kingdom. eBay Copyright: Original Listing © mithera89 - check seller ID !